Jane Culp’s landscapes possess something all too rare these days: a gutsy, go-for-broke attack, coupled with a feeling for the subtleties of traditional composition. For some thirty years, Culp has brought an Abstract-Expressionist’s sense of gesture to the paintings she’s produced, on site, in various wilderness locations. Her recent paintings, nearly twenty of which are currently on view at John Davis Gallery, depict a particularly dramatic environment — the fantastical land formations in the Anza Borrega Desert in Southern California. Picturesque scenes can be the hardest to paint, but Culp’s canvases catch the spectacle of these desert scenes without a trace of sentimentality. Working brusquely, with strokes that vary from thickly brushy to thin veils, she sizes up her subjects with business-like vigor, conveying their character through pictorial vigor rather than technical feats. Her colors vividly capture the particular light of the desert, but at every step they convey masses, too: height, weight, shifting depths. The legacy of Abstract-Expressionism shows in her tapestries of darting brushstrokes, but there’s another, equally important influence — the ordering spirit of European modernism, by which gestures, large and small, unfold within a contained vision: vast landscape, looming cliffs, deep sky. Imagine a reasonable Soutine, in an unreasonable environment. Culp turns mountains into muscular portraits: craggy likenesses that confront us across charged spaces. 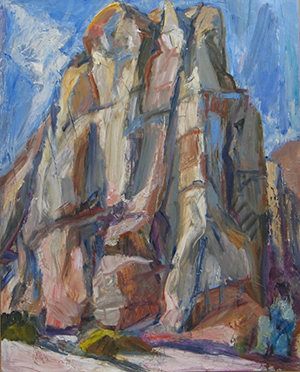 In a painting like “Cathedral Rocks, Badlands” (2013), the sentinel-like bluffs fill almost the entire surface, leaving just strips of ground and sky along the edges. Colors weight the effect; the high-pitched pinks of the ground support the bluffs, while deep blues sound the plunge to sky on either side. In “Grand Arroyo Cliffs, Anza Borrego Desert Badlands” (2013), a rocky gash spirals around another mountain, whose vertically-cleft face eloquently fills the canvas’ width. “Salisbury Pass above Death Valley” (2000) is a vast vision of piling, earthy layers. These paintings have something of the quality of devotional works, as if the artist sought to subsume herself in the conjuring of the transcendent, using purely traditional means. (Imagine, in the twenty-first century: composing in paint!) This may be why they convey such a strong sense of the moment — a moment belonging to both the artist and nature, as if their exertions were simultaneous. One suspects that Culp relies on the drama of the desert to trigger and shape her ongoing engagement with nature. It’s fortunate she’s found her motif; her landscapes at John Davis are as vital and original as any being produced today.